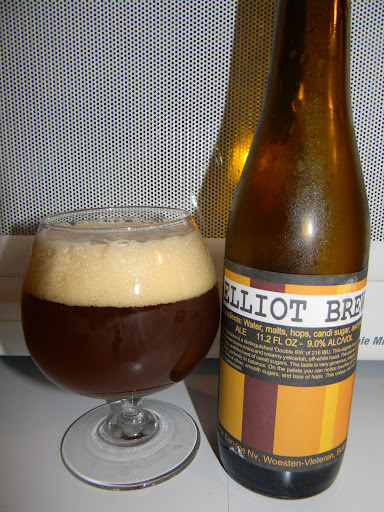 Review of De Struise/Mikkeller Elliot Brew IPA | Beer Apprentice - Craft Beer News, Reviews, Interviews and Info. Hello everyone. For today’s craft beer review I’m going to be trying the Elliot Brew IPA, which is a collaboration by De Struise Brouwers located in Oostvleteren, Belgium and the Mikkeller Brewery located in Kobenhavn, Denmark. I couldn’t find any specific description regarding this beer on either struise.noordhoek.com or mikkeller.dk, but I was able to find a great deal of information on ratebeer.com. Behold the second of RateBeer.com’s Worldwide Masters Series! This request edition ale is the crafted alchemy of a party of some of Europe’s finest brewers, Mikkel Bjergsø and Kristian Keller of Mikkeller (Copenhagen, Denmark) and Urbain Coutteau, Carlo Grootaert, Phil Driessens, and Peter Braem of De Struise Brouwers (Woesten-Vleteren, Belgium). This beer came in an 11.2 oz. bottle and it had an ABV of 9.0%. It poured a deep caramel color with an off white head that was very frothy, soft and soapy. The size was excellent and the retention time was quite good. It left behind plenty of adhesive lacing as it subsided also. The nose brought forth a sturdy dose of caramel sweetness and candied sugar. I also found it to be rather yeasty and herbal. Somewhat piny and floral. It was a little bit phenolic, but it was very well balanced and harmonious. It wasn’t extremely robust. Instead it had a medium strength bouquet that was very pleasing and satisfying. The taste presented tones of yeast and bready characteristics with some peppery spice along with gentle, earthy/herbal hops. Once more, a significant amount of caramel malt and sweetness. Just a light taste of alcohol was discovered. The hop bitterness was solid, but nowhere near like the sticky, lip puckering bitterness that one may find from an American-styled IPA. The mouthfeel was medium bodied. Smooth, dry, and just a smidgen tacky. Good carbonation and slightly chewy with a nice bit of warmth. A lot of flavor was left behind after each sip too. Well, I think we have a very good beer right here. I really liked it. I’m guessing that the De Struise/Mikkeller Elliot Brew IPA is somewhat rare. I was pretty lucky to be able to pick up a bottle. I would definitely recommend you guys snatching it up if you happen to run across one. Don’t expect that crazy hop bomb that you are accustomed to with the American IPA’s, but rather a sweet, sugary, slightly bitter brew. It’s got plenty to be happy about and quite a nice profile to boot. The drinkability was reasonably good as well, however it could be slow sipped and contemplated if need be. Be sure to let me know what you think when you try it.